Time to get grilling! No need to bore your guests with the usual burgers and hot dogs. 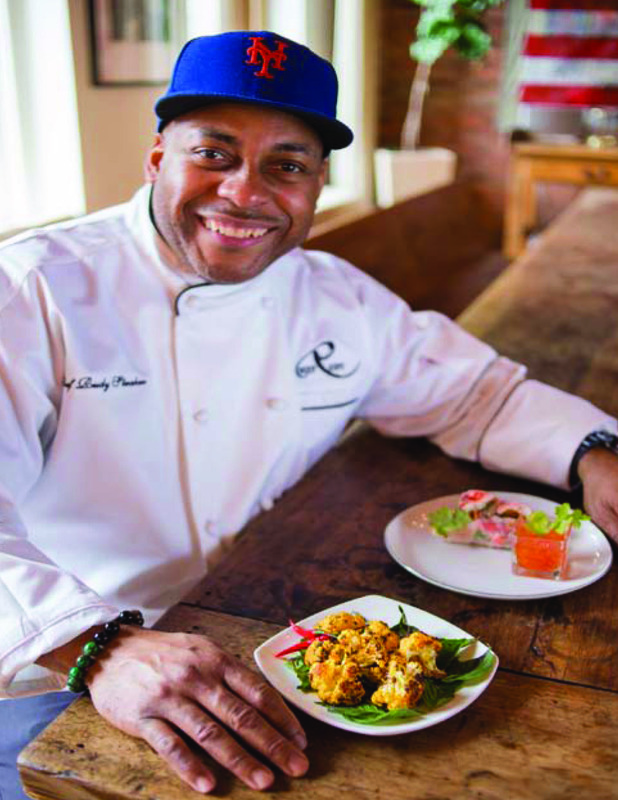 Chef Rudy Straker, celebrity chef, executive chef, private chef and businessman, offers up his signature summer dishes to celebrate the arrival of the season. Heat paella pan for two minutes on the grill. Add olive oil. Once pan is evenly coated, add chorizo sausage and sauté for two minutes. Add chicken and brown it on all sides. Add onions and cook until translucent. Add the garlic and chopped tomatoes and cook for 5 minutes. Add the chicken stock, saffron threads and two beers. Bring to a rolling boil. Stir in the rice. When the rice starts to absorb the liquid, place the clams and mussels into the rice (hinge side down). Add the shrimp, scallops and peas to the pan, cover with foil and cook for 15 minutes. Remove foil, fluff the rice and add the green olives. Cover pan and cook for another five minutes. Take pan off the grill and let paella sit for five minutes. Uncover and garnish with red peppers and lemon slices. With the back of a spoon, remove the membrane on the back of the rib slabs. Season ribs with spice rub and let ribs rest for 10-15 minutes. Light charcoal, when coals are white hot, add four wood chunks on one side of your grill. Place a cake pan filled with water in the middle of your grill. Put the lid on the grill. When thermometer reaches 225 degrees, place seasoned ribs on grill opposite of the coals (this puts smoke flavor through your ribs). Smoke for 3 hours or until the ribs reach 165 degrees. When done, slather with BBQ sauce and char over hot coals. In a large bowl, combine cabbage, kale, Brussels sprouts and apple slices. In another bowl, whisk the heavy cream, mayo, mustard, vinegar, sugar and poppy seeds together. Taste and adjust seasoning if needed. Pour over shredded vegetables and toss. Let rest for 20 minutes and enjoy! To learn more about Chef Rudy Straker, visit chefrudystraker.com.